How do we select those who will be subject to capital punishment? How do we identify the worst of the worst and decide who among them can and should be executed? Today these questions are more pressing than they have ever been. As the number of people sentenced to death and executed declines in the United States, those who are executed stand out as distinctive kinds of criminals, distinctive kinds of people. 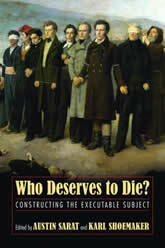 Does a death sentence affirm or deny their humanity? Is such a sentence an act of revenge or a carefully calculated act of justice? These are more than questions for policy and law. They are one way of getting a handle on how our culture understands what makes life worth preserving and of delving into its complex calculus of punishment and retribution. Who Deserves to Die? brings together a distinguished group of death penalty scholars to assess the forms of legal subjectivity and legal community that are supported and constructed by the doctrines and practices of punishment by death in the United States. They help us understand what we do and who we become when we decide who is fit for execution.